TEXAS -- City officials said they are waiting on a court ruling before they take further steps in a case that involved removal of nearly five dozen dogs from a home in the Bluffs neighborhood. The animals were removed on health code violations punishable by up to $2,000 for each offense, but city officials said they were not sure how their investigation will proceed. The owners of the house where the 59 dogs were seized Tuesday afternoon are double-booked on hearings for Monday — one in Municipal Court to determine what to do with the dogs impounded Tuesday, and another in Tom Green County Court involving a nearly identical incident last year with different dogs. Arthur Kenney and Brenda Kenney (aka Brenda Luellen), from whose home in the 6000 block of Kingsbridge Drive, the animals were removed, each face a class A misdemeanor charge of cruelty to animals because of cruel confinement in Tom Green County Court resulting from last year’s raid on their house, the county attorney’s office said. Attorneys filed the animal cruelty cases in February for the offense that is alleged to have occurred April 2008. The charge is punishable by up to a year in jail and up to a $4,000 fine. It’s not yet clear whether the dogs’ owners were in compliance with the city’s new animal ordinances. Brenda Kenney told city officials the animals were not hers. Neighbors have said two other people live there with the Kenneys. An attempt to reach the family for comment at their home Wednesday afternoon was unsuccessful. At Monday’s pretrial hearing, the defendants will tell the judge how they wish to proceed and at this stage could enter a plea. No attorney is listed for the Kenneys, said Teena Pierce, office manager for the County Attorney’s Office. At the same time and day, a Municipal Court hearing is scheduled to decide what will be done with the dogs. Judge Jay Daniel, who presided over the couple’s case last year, is expected to determine whether the animals in this case were mistreated. City officials said they received numerous phone complaints from neighbors, especially during April and May, about odors from the dogs and loud barking in the middle of the night. Neighbors also complained that on rainy days, dog excrement ran off into their yards. The dogs are boarded at the animal shelter, where they were taken Tuesday night after a visit to the veterinarian’s office. All animals appeared to be unhurt, city spokesman Ty Meighan said. In last year’s case, the animals went to a Shih Tzu rescue operation, Meighan said. Entering the house on a warrant Tuesday afternoon, City Marshals found animals, most of the Shih Tzuhs, scattered throughout the rooms. Animal services, code compliance, and city and county health officials were all involved in the investigation, Meighan said. They warned residents they had to clean up the backyard or they animals would be taken. He said the Kenneys kept the dogs inside during the day and let some out late at night. It shall be unlawful for any person harboring, having or keeping in possession any animal, including but not limited to, horses, mules, goats, sheep, swine, geese, ducks, chickens and other fowls, dogs, cats, non-domesticated animals including predatory animals, and primates, to allow the pen, yard, enclosure or other place where such animals are kept to become filthy, malodorous or unsanitary. All places where livestock is kept shall have adequate drainage sufficient to prevent standing water in pens, yards or enclosures. • Provide proper handling, treatment and immunization of animals for disease, parasite and pest control, including proper care by a veterinarian and written health records for each animal. MAINE -- A Maine judge has found a 79-year-old Somerville woman guilty of 15 misdemeanor counts of animal cruelty. But Justice Andrew Horton suspended a series of jail sentences, suggesting Fern Clark was not deliberately cruel but instead was overwhelmed by the number of animals she had accumulated. Clark was accused of 21 animal cruelty charges after state animal welfare agents seized 66 live dogs, two dead dogs, four cats and a bird from Clark’s home on Jan. 19, 2008. Clark’s attorney, Andrews Campbell, had asked the judge to acquit Clark, saying a woman “who knows each animal by name and relates to each as her best friend, spending over half of her income on her animals each month,” could not have meant to harm them. FLORIDA -- The Animal Care and Regulation Division in Broward County, Fla., says the owner of two pit bulls accused of attacking a woman and her dog has been fined $270. Division spokeswoman Lisa Mendheim said Katarzyna Zalewski of Fort Lauderdale, Fla., was fined for not having required rabies vaccination records and county pet licenses for her two pit bulls, the South Florida Sun-Sentinel said Friday. Zalewski's pit bulls have been blamed for an attack on 25-year-old Kailen Gonzalez and three dogs she was walking with her brother, Carlos. Gonzalez alleges Wednesday's attack by the pit bulls resulted in the death of her Silky terrier, Bella, while she suffered puncture wounds to her face. Gonzalez's Jack Russell terrier, Milo, was seriously wounded in the attack, while Carlos Gonzalez and his dog were unharmed. Mendheim told the Sun-Sentinel her division would review the details of the incident to determine if Zalewski's dogs, which have been taken into custody, should be euthanized. FLORIDA -- A Victoria Park woman who was the victim of a horrific pit bull attack that killed one dog and left her and another dog injured is speaking out about her terrible ordeal. Kailen Gonzalez, sporting nasty cuts and bruises on her face from the attack, told how the pit bulls relentlessly went after her and her pets on Wednesday night. "They literally, we pulled them off, they went back, pulled them off, they came back," Gonzalez said. "They had collars on, the collars were pulled off their heads. Just nothing stopped them." Gonzalez, 25, was taking her Jack Russell terrier, Milo, and a friend's Silky terrier named Bella out for a walk when two pit bulls came charging out of a nearby back yard. After a terrifying struggle, Bella was dead and Milo seriously injured. Witnesses said the pit bulls, identified as a male and female named Bobby and Shelbi, were relentless in their attack. "I saw what those dogs did to that woman...a little child, not to mention an adult, anyone would have no chance whatsoever," said neighbor Debbie London. Though it's illegal to own pit bulls in Miami, they're not illegal in Broward County, though attacks like these may be changing peoples' minds. Neighbors of the pit bulls, which reportedly belong to 53-year-old Katarzyna Zalewski and her husband Marek Zalewski, said they've filed several complaints against Zalewski, and they say it's not the dogs that are the problem, it's the owners. "We were very uncomfortable as a matter of fact. Afterwards we actually went and spoke to the cops to make sure the dogs would be removed from the premises," said one concerned neighbor. "We walk our dogs everyday and we don't want to risk that happening to us." Officials are still investigating the incident, and the fate of the two pit bulls is unknown, but the scars on Gonzalez and little Milo will take some time to heal. "There's no way you can ever compare a pit bull to my Jack Russell. I mean, my Jack Russell would never do that to another dog, to a squirrel, to a mouse," Gonzalez said. FLORIDA -- The early evening tranquility of the Victoria Park neighborhood in Fort Lauderdale was shattered Wednesday by screams of terror when two pit bulls bit a woman, killed one of her dogs and seriously injured another one. It was a moment that neighbors said they had been dreading after weeks of living in fear of the pit bulls that had moved into a house on the 500 block of Victoria Park Road. The dogs had been seen roaming the streets unleashed on previous occasions, neighbors said. Kailen Gonzalez, 25, and her brother Carlos Gonzalez, 28, were walking their three dogs about 6 p.m. along the 500 block of Victoria Terrace when the two pit bulls charged out of their backyard. "There was no mercy," said Carlos Gonzalez. "They were just attacking, attacking." Kailen Gonzalez was trying to protect Bella, her Silky terrier, when one of the pit bulls bit her on the face, Carlos Gonzalez said. By the time the attack ended, Bella was dead and Milo, Kailen's Jack Russell terrier, was seriously injured, Carlos Gonzalez said. Neither he nor his Silky terrier were bitten, but he said his sister probably will need plastic surgery on the puncture wounds on her left cheek. A Broward County Animal Care and Regulation officer took the two pit bulls into custody. It was unclear Wednesday night whether the owner was cited. The owner of the pit bulls refused to comment beyond saying, "I have enough pain, don't you think?" VIRGINIA -- A 9-year-old Shetland Sheepdog is fighting for her life after being attacked by a black bear while protecting her owner. Tierney Tredo, 19, of Penhook, said there is no doubt in her mind if it hadn't been for "Sophie," the bear would have killed her. The 300-plus pound bear attacked the dog while Tredo and her two dogs were walking in the woods of Smith Mountain on Tuesday, April 28. Sophie was taken to a Gretna veterinarian immediately following the attack. She was treated for a large wound on her left side, opened apparently by one swipe of the bear's slashing paw. The dog returned home the next day after her wound was stitched. But the family returned Sophie to the vet the following day. 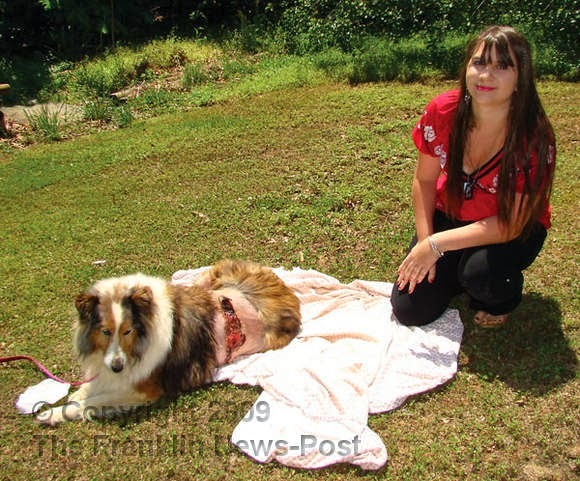 It was at that time when another slash wound, along with puncture wounds from a bite, was found on the dog's right side. Sophie remained under the Gretna vet's care for 11 days until she was released to return home on Tuesday, May 12. Tredo often walks with her two dogs in the same woods near their house. She said she had never seen a bear and she had never worried about taking strolls away from the house. She lives with Mary Plunkett, her grandmother who has raised her. The home is not far from Smith Mountain Dam. The day of the incident, Tredo said she left the house in the morning and went into the woods she normally walks with the dogs. In addition to Sophie, the family also owns a long-haired, mixed breed dog they adopted from the pound. "Cheyenne" is 2 or 3 years old. When recounting the experience, the outdoor-loving brunette vividly recalled every detail. Now, she knows the feel of a bear's breath on her leg, she said. She said they were walking along a small branch when the big dog disappeared into a thicket. Sophie, whom she has owned since she was a puppy, stayed at her side. "Cheyenne was in the thicket about five minutes before she came running out, tail tucked between her legs. She was hollering," she said. "Then I saw a shadow behind her and thought it was another dog. In a minute or so, I heard footsteps coming down toward me at the branch," she continued. "It was then I saw the face break through the thicket and realized it was a bear." As Sophie stood by her, "I started hollering 'Get away bear!' again and again." The bear approached from the other side of the branch. "I could have touched it if I had wanted. I felt his breath on my legs," Tredo continued. She said the bear was about four feet tall and dwarfed Cheyenne in size. "It started toward me, and Sophie got in front of me and started barking. And I kept yelling 'Get away bear!'" She described the bear rocking from side to side "like it was trying to figure out a way to get to me." Sophie moved to the side, barking, apparently trying to get the bear to come after her, Tredo said. But the bear kept watching Tredo while avoiding the dog. "I knew it wanted to get at me," she said. Then the bear did what Tredo feared most. The bear returned to resume her stance in front of Tredo, and Cheyenne reentered the picture. The big dog ran back to Tredo, and the bear swatted the dog on the back "but it glanced off," she said. "That is when the big dog went running back to the house." Tredo guessed about five minutes passed with things at a standoff between Sophie and the bear. The bear was still making moves, trying to get to the young woman, she said. "Finally, Sophie ran the bear back into the thicket where it came from. I could see the bear in the woods walking back and forth," Tredo said. "I could also see Sophie." The woman said what happened next is hard to believe: "Sophie looked back at me and barked like she was telling me to leave." Tredo had already removed her flip-flop sandals because she knew she couldn't run in them. "I ran a little way, and I heard the dog holler. I knew then the bear had gotten hold of her." Mrs. Plunkett was at the house, setting out plants, and heard the noise. Plunkett said she picked up a stick and ran down to the area where she heard the sounds. "When I saw my daughter, she said, 'The bear has Sophie.'" Mrs. Plunkett got into the pickup truck and drove down into the field, honking the horn. That's when she saw Sophie running toward the house. When she returned to the house, Sophie was in front. That was when she saw the massive injury to the dog's left side. They loaded Sophie into the pickup and made a hurried trip to the vet in Gretna. It took a while for him to clean and stitch the wound. When the dog was returned to the office, she was treated for the injuries on her right side. The vet bill is more than $1,000, the women said. After returning home, Sophie would not eat or drink water. "She has been throwing up and we can't get medicine to stay down," Plunkett said Tuesday. When Sophie was taken to the Franklin County Animal Hospital Wednesday, she was immediately given fluids and medicine. Dr. Eric Krauss and Dr. Jonathan Amos are treating her at the hospital at no charge. Sophie was in critical condition Thursday at press time. The incident was reported to the Department of Game and Inland Fisheries. A game warden came to investigate. He and Tredo returned to the scene. There was no sign of the bear or Tredo's flip-flops. "The bear got them, I guess," she said. Lt. Karl Martin with the VDGIF said he suspects the bear may have been a female with a cub or cubs. "Normally," he said, "the black bear is shy and not aggressive with humans. The big dog may have posed a threat when it entered the woods, causing the bear to follow it into the open." Whatever the case, the soft-spoken, young woman now has only one thing on her mind. She wants to kill the bear. "I want to get a gun and get someone to teach me how to shoot it. I want to kill that bear," she said. New York: Charged with 17 counts of animal cruelty, Peter Sparks gets one year of probation and a the chance to wipe his record clean afterwards so no one will know what he did. 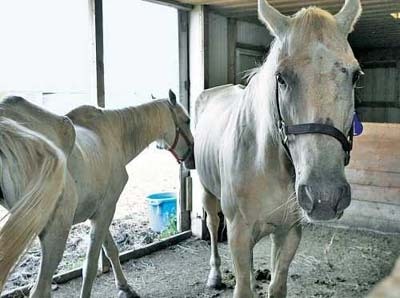 NEW YORK -- Animal cruelty charges against a Grand Island stable owner will be dismissed next year as long as he complies with court-ordered restrictions on some of the horses in his care. Peter L. Sparks accepted an adjournment in contemplation of dismissal — with conditions — offered late last month by the Erie County district attorney’s office. Sparks was charged in August with 17 counts of animal cruelty involving a dozen horses and five sheep removed from Sparks Trading Post, his Bedell Road business. State police received tips from people claiming the animals were being mistreated; employees of the Society for the Prevention of Cruelty to Animals alleged the animals were malnourished, dehydrated and suffering from untreated medical conditions. 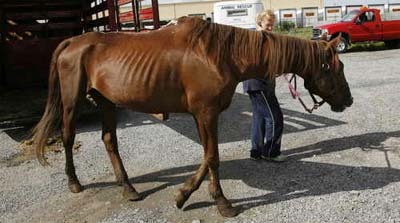 Under the terms of the arrangement, the horses will be subject to monthly inspections by the SPCA through next April. An earlier court order gave the SPCA access to Sparks’ property as the legal proceedings continued. “Our plan right now is to visit once a month,” Beth Shapiro, who coordinates animal cruelty investigations for the SPCA, said Wednesday. The first visit is expected to be scheduled later this month. During those announced visits, equine experts will examine the horses’ teeth, general condition and weight, Shapiro said. Sparks didn’t return a call Wednesday seeking comment. In September, Grand Island Town Justice Mark J. Frentzel ordered that the 12 horses be returned to Sparks because the SPCA lacked facilities to care for them for an extended period. But their number is now down to eight. Dodie was euthanized shortly after returning to Grand Island. More recently, Nipper, Destiny and Alice met similar fates because of illnesses. They gave the horses back to the abuser?! And then they all died.. big surprise. The adjournment includes conditions covering some of the remaining horses: Old Yeller cannot be ridden, and Roman and Stanley must be evaluated before anyone rides them. Had Sparks not sold off the sheep that were part of the cruelty case, the order would have included stipulations on their care. FLORIDA -- Police arrested a Hillsborough County woman Wednesday on charges of animal cruelty after finding her dog locked in a car on a hot May afternoon. When Amy Chantarak, 19, of 8649 Himes Ave N, attended Ikea's grand opening, she went inside but left her 3-month-old lab and collie mix in the car. Shoppers spotted the puppy, named Mr. Snuggles, lying on the back seat of a black Mazda with the windows cracked. One shopper alerted a police officer. The officer was able to free Mr. Snuggles and move him into an air conditioned police car. The dog was taken to the animal services shelter in Brandon. County veterinarians checked out the dog and declared him healthy and unharmed. The officer learned the dog was in the car for about 40 minutes, said Hillsborough County Animal Services spokeswoman Marti Ryan. "It could've been more, who really knows?" Ryan said. Temperatures in the car had likely reached well over 100 degrees, she said. Chantarak, 19, was arrested about 2 p.m. and booked into the Orient Road Jail. She posted $1,013 bail shortly after midnight Thursday. 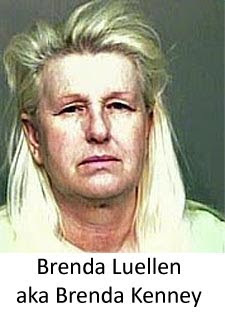 Police discovered she was wanted in Pinellas County for failing to appear in court on an animal cruelty charge from December 2007. In that case, she was accused of leaving her chihuahua Mumu in the car overnight. If she does not give up custody of Mr. Snuggles, Animal Services will petition for legal ownership, Ryan said. "This person has a track record for the same type of scenario," Ryan said. "One would get the impression that she doesn't understand or give value to the animal." CALIFORNIA -- Inside a dark, cramped trailer with food and indescribable garbage just laying about, Jack Ziniuk slept. Joining him inside the trailer were around 20 dogs, cats and birds. He owns an Anza ranch on Upper Tule Road. Dogs are bred here. They lived in these cages. The two employees here say it all started off well. But, with age, Ziniuk couldn't afford to pay for this place. The dogs went hungry. When a horse of his suffered malnutrition, sheriff's deputies charged Ziniuk with trying to put the horse down with a sledgehammer. "He didn't even have enough strength to get that accomplished for one. Two, the way he was wielding it, he missed a couple of times. It missed the body. You could hear the thumps. "I knew it was alive at this point because I could still see its tail clearly moving. It was terrible. "When he realized that he wasn't going to be able to do it that way, he told John, go get the chainsaw," said employee Phillip Thomas. 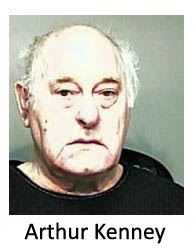 Deputies arrested Ziniuk. 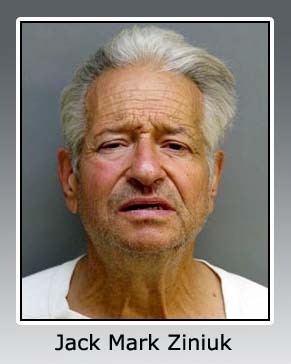 The 64-year-old could face five years if convicted. 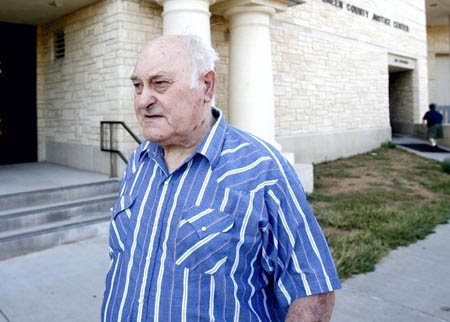 He pleaded not guilty to animal cruelty charges. We asked Thomas, "If you worked here, why didn't you tell the cops?" 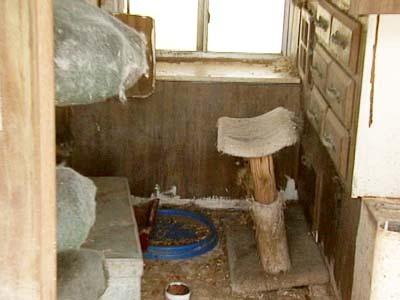 He answered, "Well, animal control has been here. They've know all this stuff. They've been trying to shut him down for so long. I don't know the legalities of that, what held this up for so long. We asked Thomas another question, "So, you would see Animal Control but they did nothing?" Thomas' answer was, "Nothing. They came here many times. They wrote him tickets that he was never intending to pay anyway." Stephanie Weyls now has 13 of Ziniuk's dogs. She says many of these breeding dogs were found in various states of neglect. Weyls said, "I received a call from a friend of mine in town that has a veterinary supply place and she told me the situation about Jack that he had been arrested and that the authorities, the animal control, were telling them to disperse the animals and find them safe places to go." Anza residents came in and rescued many of Ziniuk's dogs. Now, animal control wants to take them to a county shelter where they may be euthanized if deemed "unadoptable." "They allow people like Jack to continue to make puppies and abuse his animals and breed indiscriminately. The small private rescue that care about animals are the ones that are taking the hits," said Weyls. Animal control says people took these dogs illegally and anybody who has them is breaking the law. But, Weyls and others say they will not hand over these dogs. Late Thursday afternoon, animal control confronted Weyls and told her may forward information to the District Attorney's office for possible theft charges. 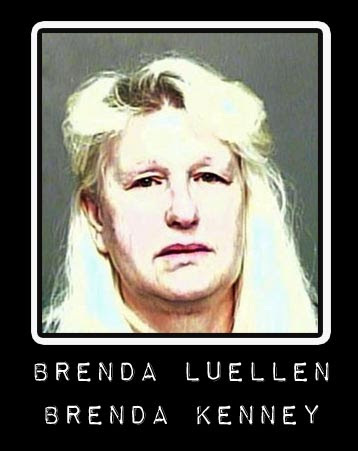 MINNESOTA -- On Friday, May 1, 2009, the Judge sentenced Kathy Bauck on one count of animal torture (Count 5). This was a single criminal misdemeanor count of torturing a Mastiff (dog) between the dates of May 14 and May 24, 2008. Bauck was sentenced to 90 days in jail for this count with 70 days stayed, with credit for 5 days already served. This means Bauck served 15 days in custody. • as long as Bauck is working with animals, she was to allow the Minnesota Humane Society or other agency (as recommended by the probation officer) to inspect the kennel without notice (as they determine necessary) and to allow inspection of the entire property — entry to all areas. • not to have same or similar violations for one year. Following the sentence, there was a bit of confusion. 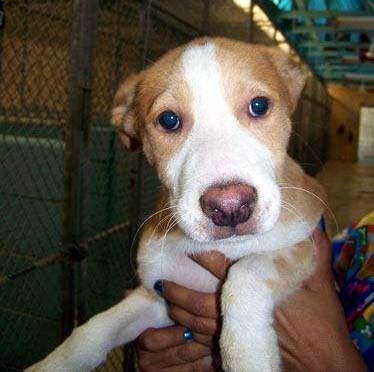 Some people believed the court had ordered a humane society to inspect the facility. At the time of the verdict, Judge Senyk ordered that the USDA and the appropriate humane society be notified of the verdict. The State made the request to the court that inspections be allowed. It was agreed that the Minnesota Humane Society (there are multiple humane societies in Minnesota) conduct the inspections during the probation period. NOTE: The court also had the ability to place further conditions and restrictions on the sentence. One condition could have been to seize the animals and/or to require that Bauck own no more animals for a certain period of time; however, these conditions were not made so Kathy Bauck was allowed to continue breeding, buying and selling dogs.